Ronan Martin is one of Scotland’s finest fiddlers. Brought up in a musical family on the Isle of Skye and with a fiddle in his hands by the age of three, he plays the classic dance music of the north and west with toe-tapping energy and an uplifting and joyful style. He is in hot demand at home and abroad as a solo fiddler and performing with many of Scotland's finest musicians including Jonny Hardie, Sandy Brechin and Fred Morrison. 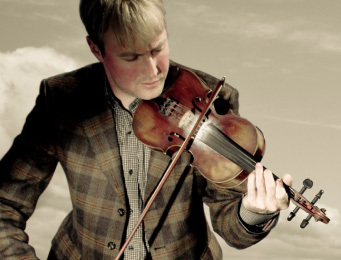 Ronan has played at Glasgow's Celtic Connections five times and has been invited to perform alongside top fiddlers from the tradition at the Annual Fiddlers' Gathering in Donegal, the North Atlantic Fiddle Convention and the Niel Gow Festival. He has toured in Germany, Ukraine, Norway, Spain, Australia, New Zealand, Libya, India, South Korea and the Middle East. In 2008 Ronan released his debut solo album to great critical acclaim. The album was a celebration of Highland traditional fiddle music and featured the fantastic playing of Jonny Hardie from Old Blind Dogs on guitar. Fiddler Magazine (USA) called it “astonishingly crisp and powerful” and “a masterful work of splendour that will endure”. He has appeared on radio and television programs worldwide, including the BBC and ABC news.